Versatility is both the friend and enemy of parsley – yes, it is a staple of every Italian kitchen garden because it marries beautifully with a range of meat and fish dishes, and is almost universally the garnish of choice; but the result of all this activity is that its subtle tones are too often taken for granted. Not so, the more suede-like sage leaf, which possesses little of parsley’s elegance, yet often proudly sits atop a range of chicken and pork dishes, and most famously on the veal escalope huddled inside a blanket of prosciutto that constitutes saltimbocca, a dish whose popularity extends far beyond its Roman home. 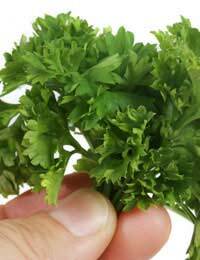 However let’s not feel too sorry for poor old parsley, or more accurately flat-leaf parsley, which in terms of the palate and the eye is much more desirable than its curly cousin. Rather, let’s look at where it can best be utilised, beginning with the aforementioned role as a garnish. Rather than simply providing a verdant blanket on soup, pasta, rice and main-course dishes that make them easier on the eye, its aniseed notes and robust texture offer an extra dimension, especially when folded through prior to serving. It should be finely chopped, from leaf to stalk, the latter part of the plant providing a slightly sweeter note to the proceedings. Given that it is no shrinking violet, parsley is happy sharing the limelight alongside a range of meats, from big hitters such as wild boar and calf’s liver to more subtle cuts of poultry. The same is true of fish and seafood, from swordfish and sea bass to oysters and baby clams, while even that most dominating of foundation flavours, tomato, is still not too intimidating to mask its virtues. While parsley can be added raw to salads, sage most definitely needs some the heat of the sauté pan or casserole to soften its tough texture. This less appealing aspect of its make-up is more than compensated for by its aromatic properties, which are among the most subtle and seductive to be found in the garden. They provide a perfumed background that allows the star attraction, be that meat or poultry, to enjoy its five minutes of fame on the plate. The same is true of its combination with some butter, several leaves gently sautéed until the fat takes on a nutty brown hue. The liquor is then poured over a chicken escalope or provides a garnish for ravioli pasta cases containing, for example, prosciutto cotto, pumpkin and nutmeg – a tasty treat ideal for Halloween. Whether you are using parsley or sage during the cooking process or, in the case of the former as a garnish sprinkled raw onto a finished dish, the fresh variety should be the only one you should choose. Yes, there are dried varieties available on the supermarket shelves, but they just don’t deliver in terms of either flavour or, obviously, texture. Indeed there is little need to turn to the dried variety as both herbs can be grown either in the garden, where they won’t just give up the ghost in the face of a mild frost, or perhaps more conveniently on a window box. Yes, parsley grows at quite a canter but given the sheer variety of dishes that you will adding it to, there is no chance of it growing, triffid-like, up the kitchen walls and down the sides of your cabinets.